MOREHEAD CITY – Back before 2012, when Joel Fodrie and others at the University of North Carolina Institute of Marine Sciences embarked on a study to see if oyster reefs effectively sequester carbon dioxide, the predominant greenhouse gas that traps the earth’s heat and leads to climate change, they were hoping for what he called recently a “1+1=2” result. In other words, the hope was that all oyster reefs served as carbon sinks, so not only were old ones providing that environmental “service,” so would new ones, no matter where you built them. But, Fodrie said in an interview last week, science is rarely so simple, and it wasn’t in this case. So it turned out that whether or not an oyster reef functions as a carbon sink – keeping carbon out of the atmosphere, where it helps trap heat from the earth – depends in large part upon where the reef is located. 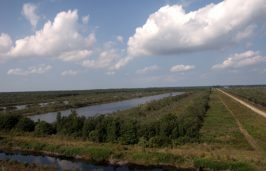 Those that are close to marshes and other vegetation do serve as significant carbon sinks, and thus are good fighters, in a sense, in the battle against climate change, Fodrie said. But at least some reefs, either existing ones, or new ones that are being built on flats away from significant vegetation, appear to be net releasers of carbon dioxide: They hold some in, they let more go into the atmosphere. Those increase in volume quickly; they are mostly shell, and the biosynthesis of shell is a carbon dioxide source. That doesn’t mean that creation of those reefs is an altogether bad thing – they provide crucial habitat for marine species and, of course, provide oysters to harvest, sell and eat – they just don’t provide the same atmospheric environmental service as reefs that are subtidal or more closely associated with marshes. In a practical sense, Fodrie said in the interview, what that means is that if you set out to build an oyster reef, “where you build it matters,” regarding what you want it to do. To put it very simply: If you want to create jobs and income, grow oysters to feed people and provide habitat for other species, too, that can be done anywhere that’s suitable to oyster reef development. But if you want to sequester carbon, near shore is the best bet. The reasoning behind that is that there are two types of carbon, organic and inorganic. Organic carbon, plant and microbial matter, is the stuff that oysters filter out of the water when they feed. Carbon dioxide is one of the ingredients that shellfish extract from the water to manufacture their shells. Inorganic carbon is extracted from ores and minerals; oyster shells are made up mostly of calcium carbonate, but also trace amounts of manganese, iron, aluminum, sulfate and magnesium, plus organic material. Reefs, then, contain both organic carbon and inorganic carbon, which lives in the shells. The organic carbon takes carbon dioxide out of the atmosphere, while shell carbon releases carbon dioxide back into it. 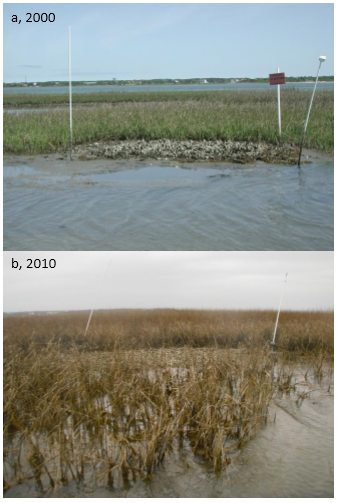 The researchers – Fodrie and Antonio Rodriguez, Niels Lindquist, Pete Peterson and Michael Piehler of UNC-IMS, plus, Rachel Gittman and Grabowski, now of Northeastern University, and Justin Ridge, then a UNC-IMS grad student – first worked on experimental reefs constructed 10 years earlier in the Rachel Carson Estuarine Research Reserve near Beaufort by Grabowski, who at the time was a graduate student at UNC-IMS. They’ve discussed their findings publicly before, but Fodrie said it was important to get it published by the Royal Society, because it’s a stringently peer-reviewed scientific journal. The society published biological works in its “B” proceedings, and publishes mathematical, physical and engineering sciences work in its “A” proceedings. It was important to use those experimental reefs, he said, because the researchers knew how old they were, and could measure the cores of the shells and the sediments to determine annual carbon burial rates. Using a gas-powered jackhammer, they pounded pipe through each reef and used a car jack to extract the sediment-filled pipe. They found that the subtidal or marsh-fringe reefs held much more carbon in the sediments between the shells than those farther from shore. 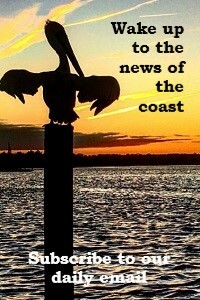 It wasn’t, Fodrie said, what they’d really hoped for; it didn’t turn out that simply building oyster reefs, as the state Division of Marine Fisheries and the North Carolina Coastal Federation are doing, will automatically result in sequestration of carbon. But it was, and is, good science, he said, in part simply because it didn’t turn out exactly as they had hoped it might. There wasn’t a perfect correlation between the researchers’ initial hopes and their findings, and often that’s what science is all about. “You don’t,” he said, want to do a study and publish results that “overpromise.” You want to be honest. So should the state fisheries division use this information when it builds reefs? “They are interested in what we’ve learned, but I don’t think they can ‘serve that master,’” Fodrie said, because that’s not the goal of the state’s reef-building efforts. The division does it for the economics, for the water-cleansing function oysters provide, and for the habitat. But what about (the federation), which not only pushes oysters as habitat, water-cleaners and job-creators, but also is very much interested in ways to slow climate change? 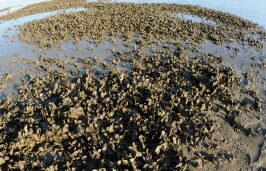 The federation annually plants thousands upon thousands of oyster shells near shore as it creates “living shorelines,” which generally included marsh plants and are natural alternatives to the bulkheads waterfront property owners have built for years to slow or stop shoreline erosion. The UNC researchers haven’t worked at living shorelines, but Fodrie said it would be a fun theory to test, and it makes sense that they too might be carbon sinks. And those shorelines also provide habitat, and encourage the expansion of marsh, which has long been known to be a valuable and important carbon sink in and of itself. Eventually, the team’s research moved on to study natural reefs, some hundreds of years old, one about 4,000 years old, all in the in the Core-Albemarle-Pamlico sound estuarine system, and the findings generally matched the findings at the decade-old reefs in the reserve. “Notably, down-core carbon concentrations in 100- to 4,000-year-old reefs mirrored experimental-reef data, suggesting our results are relevant over centennial to millennial scales …” the team’s Royal Society paper states. “Globally, the historical mining of the top meter of shellfish reefs may have reintroduced more than 400,000,000 milligrams of organic carbon into estuaries. 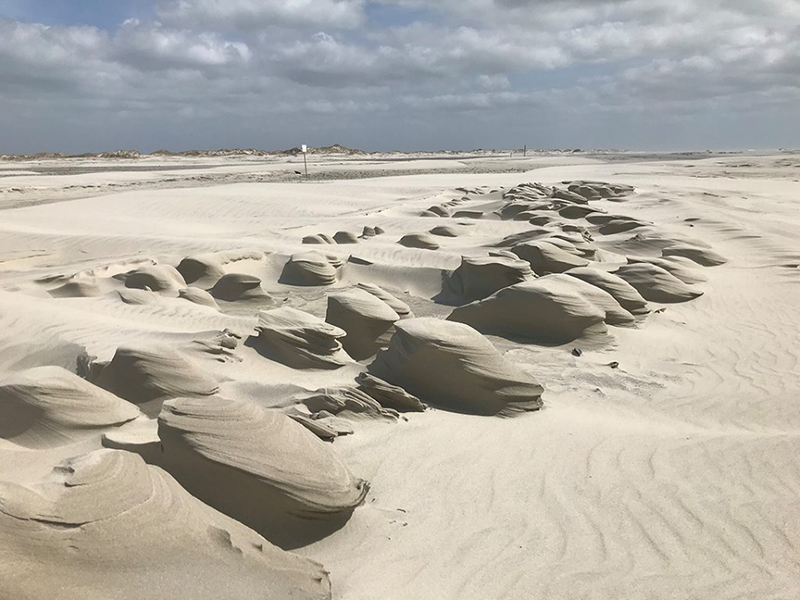 “Importantly, reef formation and destruction do not have reciprocal, counterbalancing impacts on atmospheric CO2, since excavated organic material may be re-mineralized while shell may experience continued preservation through reburial. 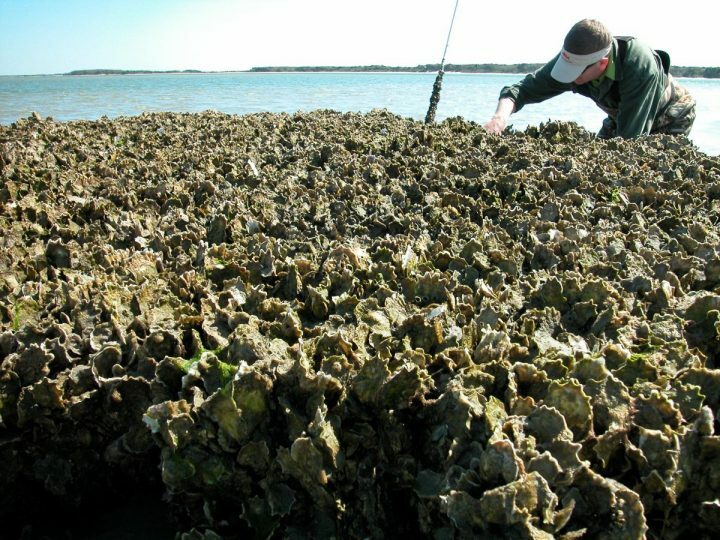 The IMS oyster reef research has been funded by grants from the Albemarle-Pamlico Estuarine Program, North Carolina Sea Grant, the North Carolina Division of Marine Fisheries and the National Science Foundation.